"We live in the world, and shape the world we live in, through the language we use. Ecolinguistics studies this relation between language and the world. Ecolinguists describe, but also critique, forms of language that create but may also threaten environments and languages. This book brings together the best in ecolinguistic scholarship and contains chapters that merge linguistic analysis with reflections on science, politics, philosophy and ethics. Anybody trying to understand our future life on this planet should find something interesting to read in this collection." 18. ‘Global warming’ or ‘climate change’? 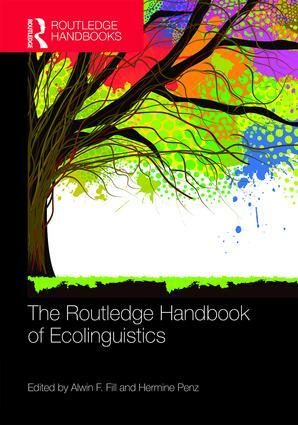 C. How do language and discourse transport ecological and unecological ideas? 22. Overcoming anthropocentrism with anthropomorphic and physiocentric uses of language? Alwin F. Fill is Professor Emeritus of English Linguistics at the University of Graz, Austria. His main research areas are Ecolinguistics, Impact Linguistics, Language and Suspense and Linguistics for Kids. Hermine Penz is Associate Professor of English Linguistics at the University of Graz, Austria. Her main research interests lie in the fields of pragmatics and discourse, intercultural communication, and language and ecology. She is the Special Issues editor of the journal Pragmatics and Society.